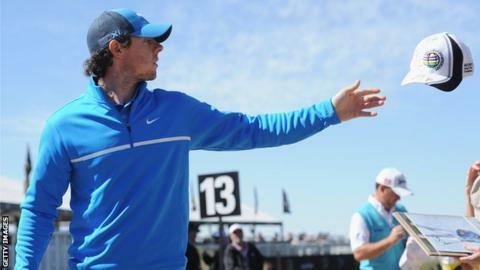 Rory McIlroy says he is much happier with his game heading into the WGC Match Play Championship. The 23-year-old world number one blamed his swing after a premature exit from the Abu Dhabi Championship last month. But McIlroy, criticised for switching from Titleist to Nike in a lucrative deal, has arrived in Arizona with a new putter and a slightly heavier driver. "The clubs were performing fine in Abu Dhabi, it was just the fact that I wasn't swinging my best," he said. "I feel like I've turned a corner with my swing. I've got it back on track, and that's ultimately what's going to help me play better. "I'm much happier with how I'm swinging the club." McIlroy, runner-up in 2012, plays Shane Lowry in the first round on Wednesday. "I've had a nice few weeks off and I feel like I'm coming into this event prepared, ready and swinging the club well," he added. "Hopefully that can translate into playing some good golf and getting quite far into this week." Six-time major champion Nick Faldo described McIlroy's decision to switch his golf brand as "a dangerous move". But Northern Irishman McIlroy responded: "Nick Faldo doesn't know how I feel over the golf shot and I don't know how he felt, but my guess is he was a little more analytically minded than I am. "I try and keep things as simple as possible. "If I see the ball going in the direction that I want in the flight that I want, then I'm happy. It feels good, and hopefully I can show that to everyone this week."